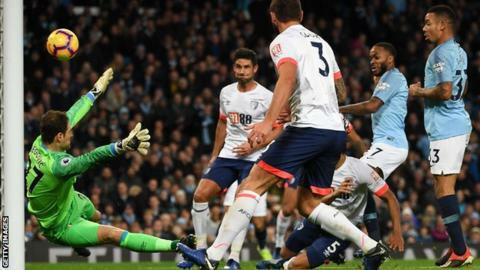 Manchester City saw off Bournemouth to increase their lead at the top of the table to five points, as goals flew in across the Premier League on Saturday. The champions were made to work as the Cherries levelled through Callum Wilson, before Raheem Sterling and Ilkay Gundogan wrapped up a 3-1 win. City's title rivals all play on Sunday. Crystal Palace earned their first home win of the season as they saw off Burnley, while Brighton fought back to beat 10-man Huddersfield. James McArthur put the Eagles ahead in a dominant performance, with Andros Townsend adding a spectacular second to steer Roy Hodgson's side clear of the bottom three. Meanwhile, Steve Mounie was sent off for Huddersfield with the Terriers leading 1-0 after Mathias Jorgensen's first-minute opener, only for Shane Duffy to level for Brighton before Florin Andone netted the winner. Any of the fans staging an 11th-minute "walk-in" protest at Newcastle would have been greeted by West Ham's Javier Hernandez putting the visitors in front, with the Mexican adding a second and Felipe Anderson wrapping up a 3-0 win. Leicester City climbed to seventh in the table after James Maddison scored a fine individual effort to add to Jamie Vardy's opener from the spot in a 2-0 victory over Watford, who had Etienne Capoue sent off. There were four first-half goals in the evening game at St Mary's as Manchester United fought back from 2-0 down to earn a point at struggling Southampton. Stuart Armstrong's third goal in two games and a Cedric free-kick had given Saints hope of moving out of the bottom three, but Romelu Lukaku's first goal since 15 September and Ander Herrera's flicked finish gave Jose Mourinho's side a share of the points.